In previous posts I have talked about how difficult it can be to eat vegetarian food when eating out whilst being gluten-free. Inevitably your options will be pastry, pasta or bread based. Before going gluten-free, I would almost always order the vegetarian option because more often than not, it would be something with goats' cheese and I really love goats' cheese. 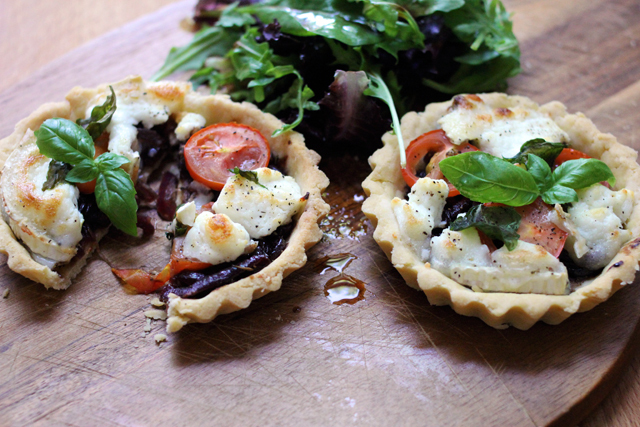 These goats' cheese tarts are simple and utterly scrumptious and actually quite portable, so are great for taking into work or even on a picnic. 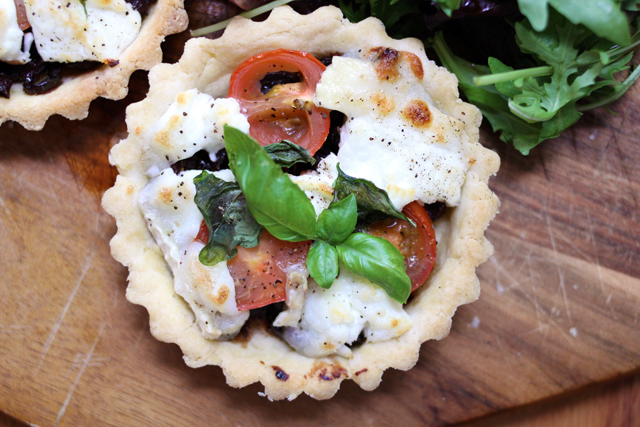 Preheat the oven to 200ºC and grease 5 small loose bottomed tart tins with a little bit of olive oil and set aside. Roll out the pastry on some cling film to about 5mm thick. Turn a tart tin upside down and place onto the pastry. Carefully cut around it leaving a centimetre or two around the edge. Then lift onto the tin and push gently into it. 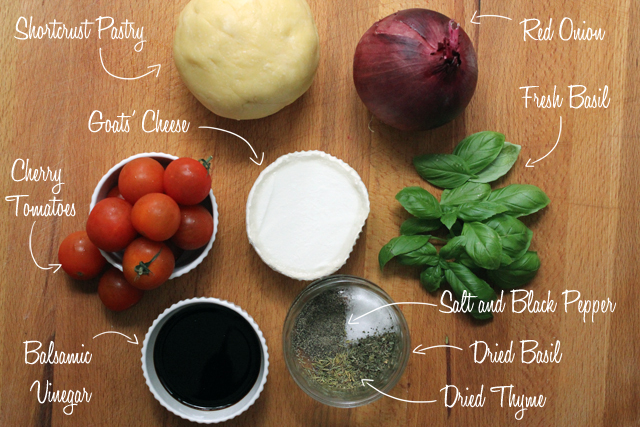 Fill in any gaps with small amounts of pastry (see post about shortcrust pastry). Repeat for the other four tins. Cut out five pieces of baking paper to fit into each of the tins. Place them in the tins and pour baking beans onto each. Place on a baking sheet (this makes it so much easier to put in and remove from the oven), then bake in the oven for 10-15 mins. Remove from oven, leave to cool slightly then remove the baking beans and paper, then set aside. Turn the oven off and preheat the grill to 200ºC. 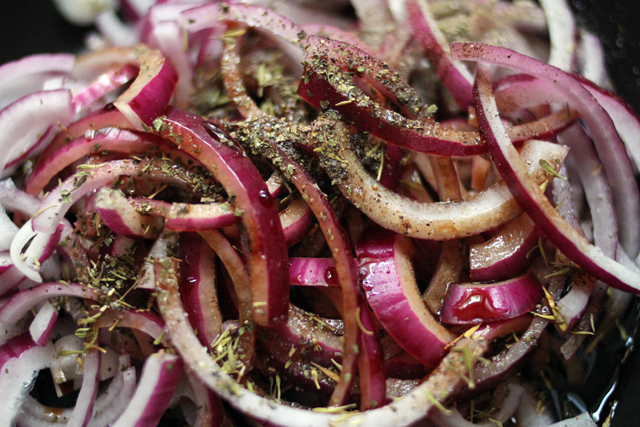 Thinly slice your red onion with the grain, so that you make long, thin slices. Separate the slices and then place in a small frying pan. Add the balsamic vinegar, dried thyme, dried basil, salt and pepper. Place on the hob and turn on to a medium heat. 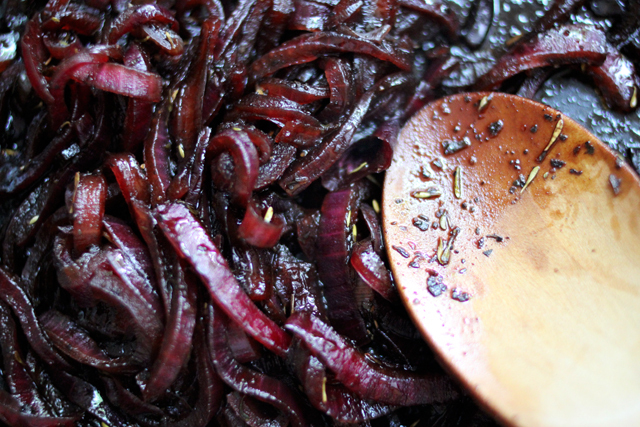 Gently bring to the boil and then allow to simmer so that the onions become soft and the balsamic becomes sticky. You can add sugar or agave to make it even sweeter and stickier. Whilst this is cooking, slice your tomatoes into three and remove most of the seeds. After about 15 minutes, remove the onions from the heat and leave to cool slightly. Divide the onions evenly between each tart, covering the bottom of the tart case. 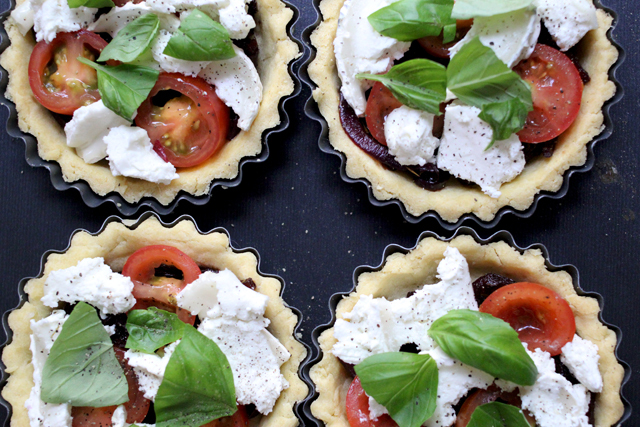 Add three slices of tomato per tart and about 20g of goats' cheese per tart also. Add a few torn up leaves of basil and a little sprinkle of pepper and then pop under the grill for about 10 minutes, or until the cheese starts to bubble and turn golden brown. Remove from oven and leave to cool. 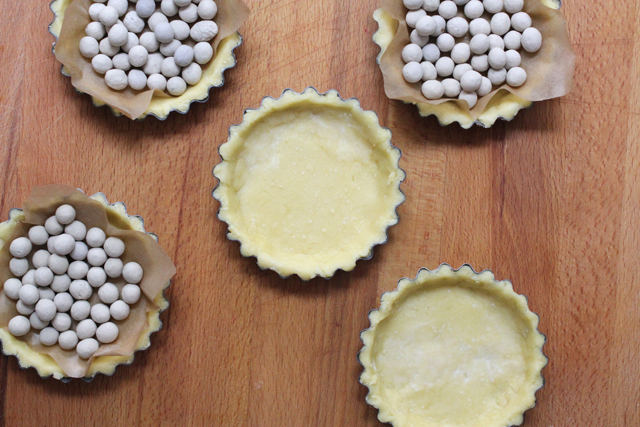 Carefully remove from tart tins by placing on a small, upturned glass and pushing the tin away from the pastry, then removing the loose bottom from underneath. 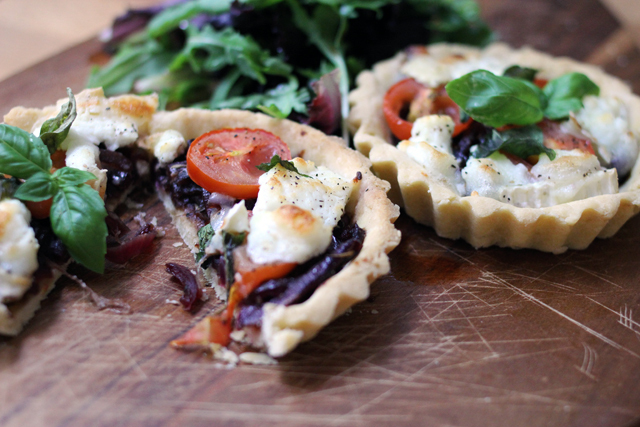 These tarts are delicious warm or cold and especially nice served with a green salad with a drizzle of some more balsamic vinegar - perfect for a summer lunch. They take a bit more effort than going out to eat, but they are completely worth it. These sound (and look) delicious!